Frank Butler had a dream. In July 1969, he designed and built the first Catalina 22 in North Hollywood, California. This petite, family-friendly cruising sloop was his fledgling company’s inaugural boat. If things went well, he hoped to build 100. Met with runaway success, Catalina Yachts launched the Catalina 27 and shortly thereafter the Catalina 30. By February 1975, Butler’s projected construction of 100 Catalina 22s had been exceeded, with an astonishing 5,000 hulls in the water. The original Mk I sloop had a cast-iron swing keel, making it ideal for trailering, but Butler soon offered a fin-keel option for those planning to keep their boats in the water throughout the season. The swing keel was most popular among trailersailors who purchased the Mk I at such a pace it was difficult for the company to keep up with the demand. By September 1980, production of Catalina 22s had reached 10,000 and the hulls were being cranked out at the company’s East and West Coast plants, in England, Australia and Canada. In Australia, the boat became known as the Boomaroo 22 and in Europe was marketed as the Alacrity 22 or Jaguar 22. The Mk II version, sometimes referred to by the Catalina 22 National Class Association as the New Design, was introduced in 1986, starting with hull No. 13,143. Its eight-year production run lasted through 1994. The Mk II featured the latest building materials, a longer cabintrunk, a more modern and spacious interior and an optional wing keel. It had an enlarged deck and the exterior teak was eliminated. It was also heavier than the Mk I and eight inches beamier. Catalina 22 purists complained because the boat’s weight had increased by hundreds of pounds and made its owners less apt to participate in one-design racing. But the Mk II has since found its niche among cruisers and daysailors. The Mk III was launched in 1995 with hull No. 15,344 and regained characteristics of the original Catalina 22. The Mk III also featured a swing keel made from lead encased in fiberglass. A sales slowdown affecting the Mk III was evident since less than 1,000 were made before it ceased production 2010. In 2004, the company released the Catalina 22 Sport, starting with hull No. 15,540. The Sport model has the same hull and similar weight of the earlier 22s, so it can race in one-design fleets. Its deck and interior are in line with contemporary design, the cockpit roomy and the interior comfortable. Catalina Yachts has been steered since its inception by Butler and longtime friends Gerry Douglas and Sharon Day. 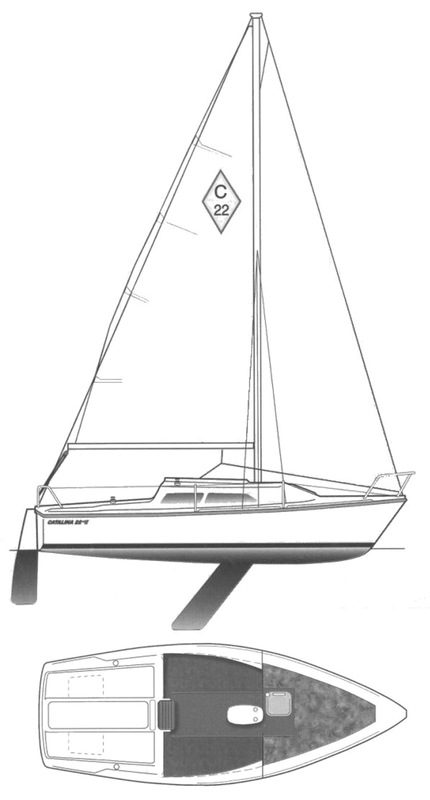 According to Douglas, the Catalina 22 was designed as a family cruiser equipped with a mainsail and 110% jib. Racers wanted more, so a 150% jib was added to the inventory. The Catalina 22 became one of the most popular sailboats ever built and active fleets dot the country on lakes, rivers and oceans. Richard and Denise Fox of Indianapolis, Indiana, authors of a book on the C22’s history, contend the boat is also popular because of those who sail them. “It’s an inviting class that encourages couples and kids,” Richard Fox said. 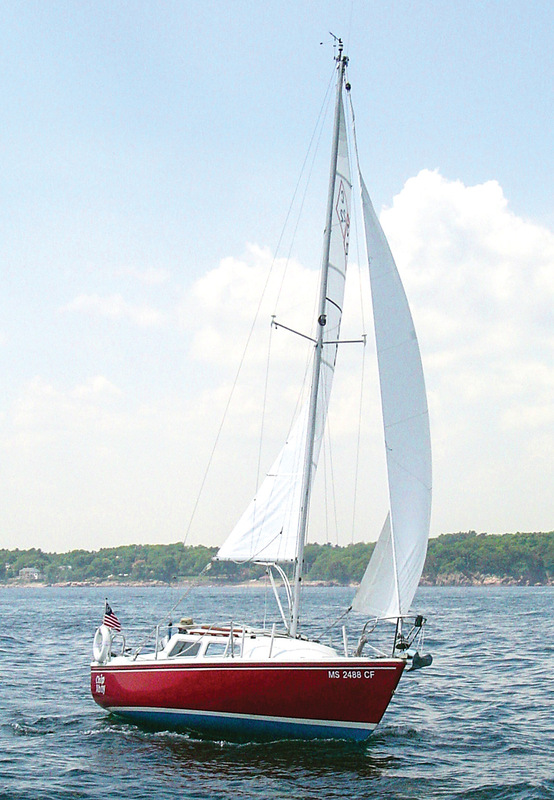 Chip Ford of Marblehead, Massachusetts, who has lovingly restored his 1974 Mk I Chip Ahoy, praised the swing-keel design after running aground on a mud bank. The Catalina 22 is a compromise in most respects, which shows in its practical appearance. There’s no dramatic sheer, no graceful overhangs, no sleek deck layout. And that’s exactly what designer Frank Butler intended. It’s a simple boat providing the basic essentials for first-time sailors or budget-strapped families looking to daysail, weekend cruise or maybe join a racing fleet. Despite its small size, the C22 is built like a beast; the solid hull is hand-laid fiberglass, the deck a fiberglass sandwich with wood core. The interior is made from a one-piece pan liner, an idea Butler learned from Lockheed, which used the process when building its airplanes. “You won’t find a better built boat for the money,” said Bill Brooker, an ASA instructor at Sara Bay Sailing in Longboat Key, Florida, where C22s are part of the school’s fleet. Like most any older boat, delamination is always possible from water intrusion in the deck, so check for bulges, discoloration and loose hardware. The aluminum-trimmed windows tend to leak. Some of the earliest C22s had plywood stringers that could be prone to rot. Boats made after 1976 have beefier masts and larger gauge standing rigging. The cable and pivot pins on the swing keel may need replacement due to wear from side-to-side movement. The spring that provides tension for the clutch on the keel winch may also require attention. Inspect the hull for damage if the boat had been trailered extensively. If the model has a pop-top coachroof, examine the gasket for wear or deterioration. Owners report that the cockpit scuppers are slow to drain and many have installed additional scuppers on the transom. The mast is supported by one set of spreaders, one set of upper shrouds and two sets of lower shrouds. There’s no halyard winch. The portlights don’t open, but a forward hatch provides ventilation. On the Mk II, the solid fiberglass hatch was changed to smoked acrylic. While not exactly a walkaround deck, there’s enough space to tiptoe from the cockpit to the foredeck. The jib car tracks are short, which limits the ability to fine tune the sail trim. Small jib sheet winches are bolted on the cockpit coaming to either side of the companionway. There’s an adjustable, transom-mounted mainsheet traveler. On original C22s, the foresail is hanked on unless a roller furling system has been installed. The companionway has three hatch boards. The sloop has tiller steering and a roomy cockpit for its size. A lazarette offers storage and contains a bilge pump with a handle accessible from the cockpit. Boarding ladders were optional. For a 22-foot boat, it’s surprisingly spacious belowdecks, although headroom can be a challenge. In 1973, Catalina introduced the pop top, basically a device that lifts the coachroof on four stainless legs. The pop top increases headroom from 4 feet, 4 inches to 5 feet, 7 inches. The mast relies on a compression post installed to port in the cabin. Some storage is available under the settee. The earliest boats had no anchor locker but this was changed on later models with a bulkhead installed to separate the V-berth. Brooker said the C22 requires less muscle to handle than other learn-to-sail boats. It’s no surprise that the fin keel model points more efficiently than the wing keel. The outboard engine is mounted to the transom, which is typically a 3.5-horsepower Tohatsu a connected to a portable 6-gallon fuel tank or a small propane tanks. Daysailer, club racer and weekend cruiser, the versatile Catalina 22 is well-suited to the new sailor, those stepping up from dinghy sailing, or young families on limited budgets hoping to get out on the water. LOA 21’6”; LWL 19’4”; Beam 7’8”; Draft (swing keel down) 5’; (swing keel up) 1’8”; Displ. 2,490 lbs. ; Ballast 800 lbs. ; Sail area 205 sq. ft.